Congo Siasa: How many ex-CNDP commanders have defected? I have updated the second document since the original posting. The M23 rebellion is staffed largely by ex-CNDP officers who mutinied starting early April, demanding the implementation of the March 23, 2009 agreement with the government. That deal brokered their integration into the national army, and the officers say that many of its aspects - including the confirmation of their ranks, adequate salaries, political positions of their cadres - were not respected, and that they were discriminated against. So how many have defected? Here are two tables that go some way to addressing this question, although further research is needed. 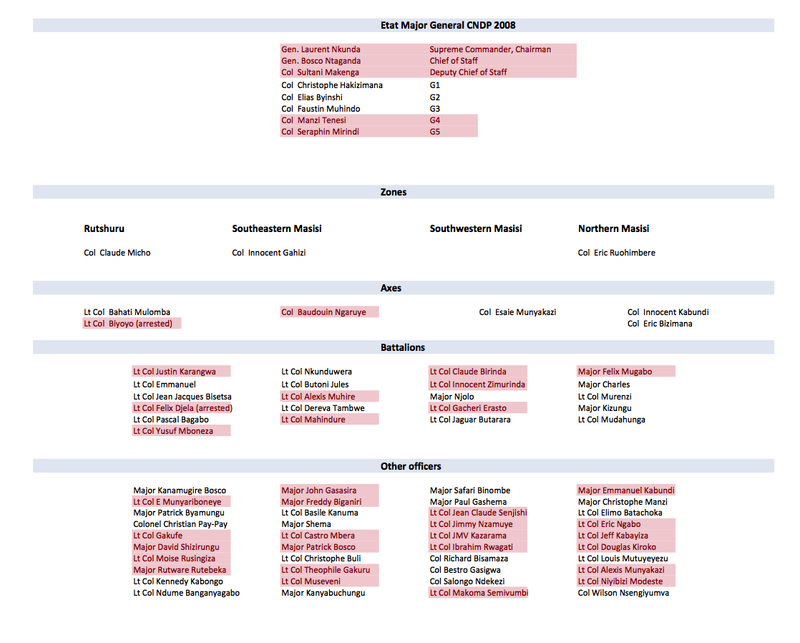 First, a table of the CNDP structure in 2008, just before integration. I have provided their ranks just before the M23, and tried to list most of their senior officers (feel free to submit other names). 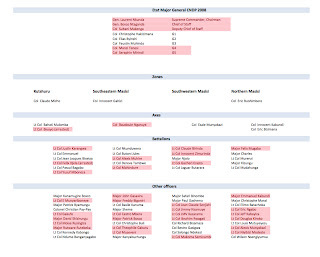 In red are members who have defected to the M23. As one can see, they constitute about half of the senior ex-CNDP officers. 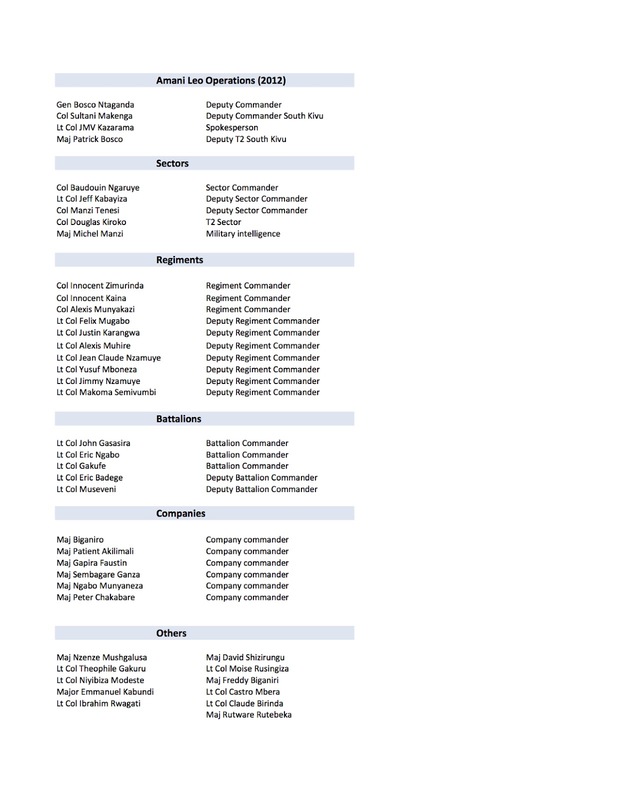 Secondly, a table of the defectors' most recent positions in the FARDC before leaving. This shows that, while some very high ranking commanders have defected, it is a small portion of the officer corps. 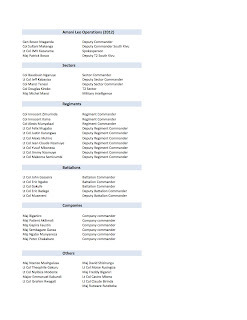 For example, of the nine sector commanders, one ex-CNDP has defected (although two other, non-CNDP, have also defected, including ex-PARECO Col Saddam Ringo and ex-Mundundu 40 Col Albert Kahasha). What was true yesterday is still true today : we need a responsible Reconstruction of the army.We can don't have any control on what the donors will do with their money but we can change the way we are fighting this war. It should not matter if Rwanda, Uganda and Burundi are meddling,the whole point of having an army is to defend the country not to ask others to do so for us. I'm surprised that we there is no para units so far, the air force is reduce to 2 helico parked in Bukavu and the corrupted officers are still in charge. without seriousness and discipline, we have a long way to go. Anyway very interesting article.Please provide as well the list of FDLR ranks and deployment as former UN GOE.Is the list that will be submitted / or submitted by Steve Hege and Co to the UN security council? We need to do more to find these Kagame associate killers who have been wanting to pollute EAST CONGO. We got to take more actions and take it soon. Beautiful. Beautiful. I can’t believe just how so many kagamists crawl out of the woodwork to “celebrate” whenever Congo endures pain (Rumangabo and Rutshuru invasion, and now the aid unfreeze by England(whose companies are the ones cited in all UN reports for trading in blood-minerals in the Kivus)). As our national hero Mzee LD Kabila said this is very long long war, you guys have been winning just skirmishes. As for me, I am so happy. As Congolese, we have never been here before in the last 15 years. There is nothing more dangerous than when the situation is too fluid; Nothing like fighting an unknown, hypocritical or embedded enemy. NOW, all has been cleared out. Even the often ambiguous DRC government can’t pretend not to know who our internal and external enemies are NOW. (1) We need a “core army”. No more army of rebels. Instead of having a rabble of 105000 useless ex-militia troops, let’s have 30 000 disciplined, determined and organized soldiers from all over our land. (2) We need a “core classe politique”. The Congolese politicians (pouvoir et opposition) are despairingly opportunistic and untrustworthy bunch. It is NOW time to have, even or in fact through brotherly cooptation (secret society) individuals (from pouvoir and opposition , business and civil society like in the USA) who are disciplined and sworn by blood to eliminate this 15-year humiliation and make Congo what it is, the greatest African nation to the world once again. Remember, one of our national heroes President Mobutu once said that “Pour le Congo je pactiserais avec le diable”. This the time to do that! Thank you Jason for this information. Makes the picture just a little clearer, which is always useful when speaking on Congolese affairs. Much gratitude! True Congolese soldiers don't abandon their Country and turn it into a Rwanda and Uganda Ping-pong-while England and USA run the Bookies. What we have are war criminals on the run!! Real reform will start with the removal of all the remaining CNDP ,RCD etc .also many of the Sun City opportunists from various Rebel groups have to be removed from the military.we can't continue to have an army that is infiltrated with Rwandan spys whose only aim is to sabotage the Country,passe national secrets to the enemy etc...most of those Criminals on that list should be arrested.Congolese soldiers will never obey orders from those officers .that deal and integration with the former terrorists (CNDP)was forced on the DRC by our international partners who did not understand the region and many of them believed the lies and propaganda that the Rwandan dictatorship and It's MAFIA partners where sending all over the international Medias for the last 18 years. Now It's time for the DRC government to do what is good for the Country.99.9% of the Congolese people want all those people removed from the army,the police and even the parliament.all the former CNDP and most former RCD are just Rwandan spys who needs to be arrested and Charged with spying on the Country.most of them are also war criminals who like BOSCO NTAGANDA shall also be Charged with war crimes and crimes against humanity. this is pure anti tutsi propaganda, fully supported by Human rights watch,another anti tutsi organisation,period!